Camp NaNoWriMo Day 21: I’m a Winner! 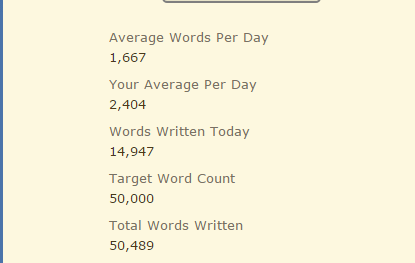 I won Camp NaNoWriMo today with 50,489 words, according to their validator. I am SO happy and proud of myself and I’m so glad I stuck with it. This month has been a whirlwind of ups and downs, but the ups have always been so much better than the downs. So this month has been a struggle. The beginning of the month was amazing and I wrote about 26,000 words in the first seven days. Pretty damn impressive, if I do say so myself. My average was obviously higher at the beginning of the month considering how many times I plateaued and didn’t write for days on end, but hey, it’s cool. Most of the time I was ahead of the game. Actually, I stayed ahead of the game even though my count caught up to me (I was still about 500 words ahead). Today alone I wrote almost 15,000 words. Suffice it to say, my brain is exhausted. I started at 6AM this morning and after 5k words, took a nap, and then just kept going and going until I reached my goal. My story has been progressing nicely and I’m really enjoying it so far. 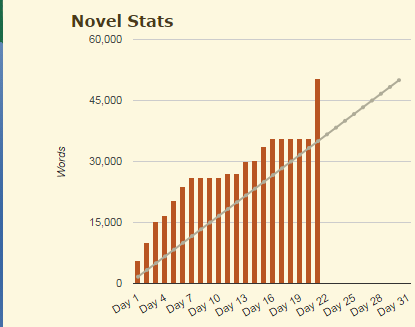 I’m still not done, though, even though I reached my word count goal for the month. It’s crazy to think that I’m creating this story, that this story isn’t even done and it could lead to a potential two more books. I’m freaking pumped. Though there were some rough times, I look back on them as times I just needed to rest. They were times I needed to just relax and not worry about word count goals or winning anything. When I wrote just for me, and saw that word count go up and up, I was happy. Now that I’ve won and Camp is over for now, I’m going to keep writing my story to its completion. But now at a much more relaxed pace. I’m very thankful for the support I’ve had so far and the support I hope to have as I continue on this journey as a writer. It’s definitely an adventure, but I wouldn’t wish for any other. How has your writing been coming along? Have you reached your word count goal yet? How far behind/ahead are you? There’s still time to win this thing, so keep going! Keep writing! This entry was posted in NaNoWriMo and tagged camp nanowrimo, day 21, NaNoWriMo, National Novel Writing Month, story, winner, winning, write, writing. Bookmark the permalink. Thank you! Yes, the weight has been lifted and I no longer feel like I *have* to rush to get it done.